IPL 2019: CSK is cruising in a 161 chase. 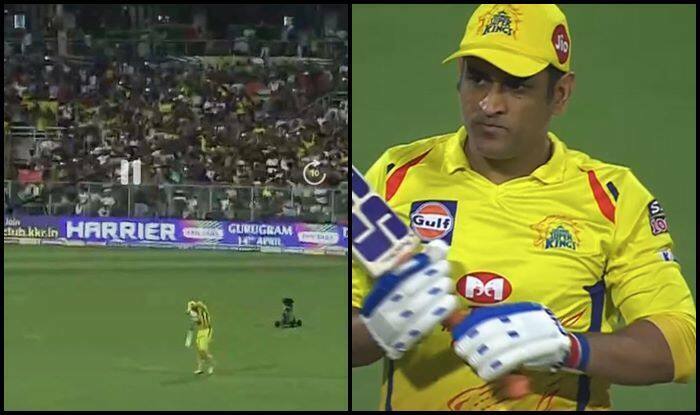 IPL 2019: CSK skipper MS Dhoni walked into the center at Eden Gardens to a rousing reception. He walked into bat at the departure of Kedar in the 12th over when Piyush Chawla scalped him. As the crowd spotted Dhoni walking into the middle there was a huge roar as fans started chanting ‘Dhoni, Dhoni’. Dhoni is no stranger to such receptions. He gets it wherever he plays across the globe. The 37-year-old has been in good form this season and CSK would hope he can take them over the line against KKR. Earlier in the day, Imran Tahir snared four wickets as Chennai Super Kings (CSK) restricted Kolkata Knight Riders (KKR) to 161/8 in 20 overs in their Indian Premier League (IPL) return leg fixture at the Eden Gardens, here on Sunday. Recording his best figures (4/27) in the competition, Tahir bowled a game-changing 15th over to account for Chris Lynn (82; 51 balls; 7×4 6×6) and Andre Russell (10) to dent the KKR’s surge. Russell who came into the tie with six 40-plus scores hit Tahir for a four and a six before getting out with the scoreboard reading 133/5. At the time of filing the copy,CSK was 113/4 in the 15th over.